Raise your hand if you love strawberry shortcake!! My strawberry shortcake thoughts were immediately confirmed when my boyfriend took a bite and declared that they totally tasted like strawberry shortcake, without me having described them as such. 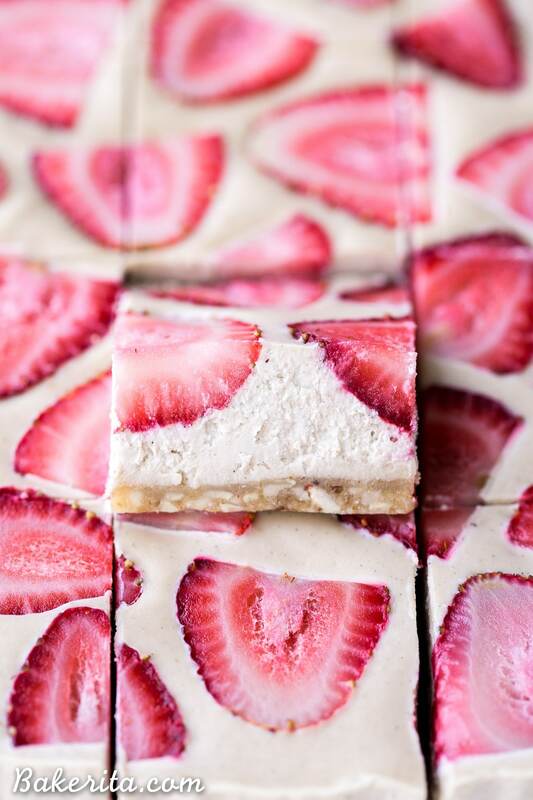 So Strawberry Shortcake Bars, they are. Now let’s talk about what exactly makes these babies SoOoOoOo delicious. Bonus: the whole recipe is made in the food processor or blender (I used my Vitamix, as usual), and there’s no need to wash it between crust and filling. Win! If you haven’t prepared and want these ASAP, you can pour boiling water over the cashews instead and let them soak for about an hour – the filling won’t be quite as smooth and creamy but it will still be delicious! Once your cashews are nice and soft, combine them with coconut milk, coconut oil, maple syrup, lemon juice, and vanilla in the blender or food processor. I used vanilla bean powder – my favorite stuff ever, but vanilla extract or a scraped vanilla bean also works. Then just blend, blend, blend into oblivion. I just let my Vitamix run for a few minutes while I clean things, and it turns out sooooo creamy and smooth. 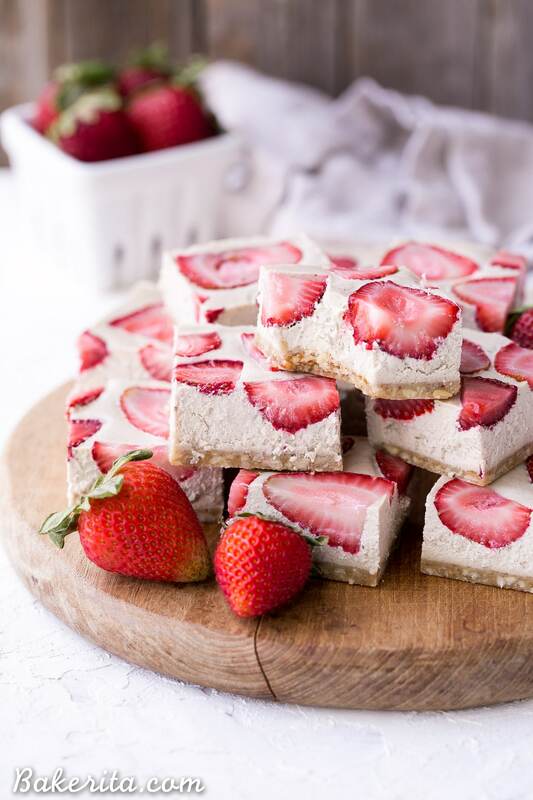 Pour your filling over the crust, and place your strawberry halves all over. 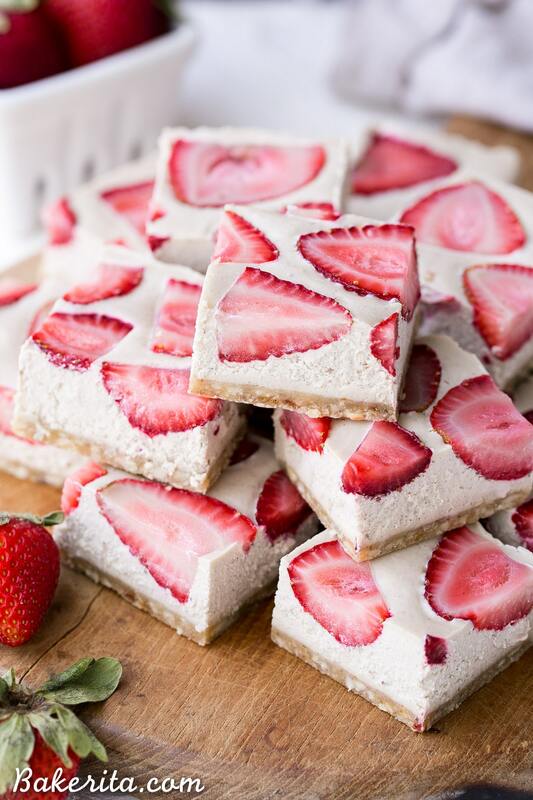 It doesn’t matter whether your strawberries are fresh or frozen, since you’re putting them into the freezer anyways. Freeze them for a few hours to firm up before slicing and serving! 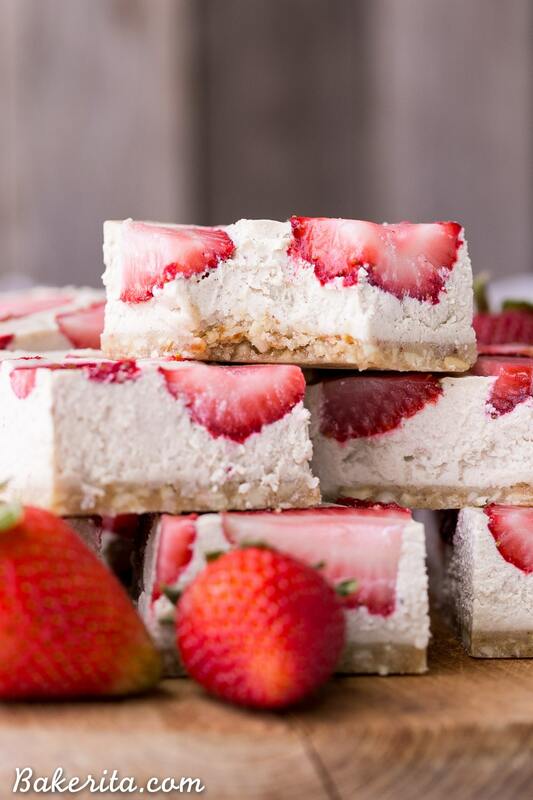 Looking for more no-bake cashew-based goodness?! Rachel! These bars are just the prettiest things! 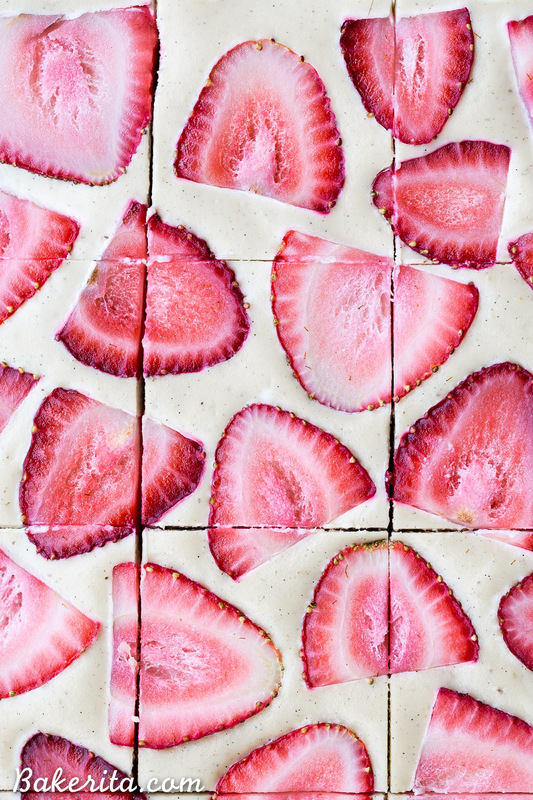 I absolutely love how you did the strawberries. 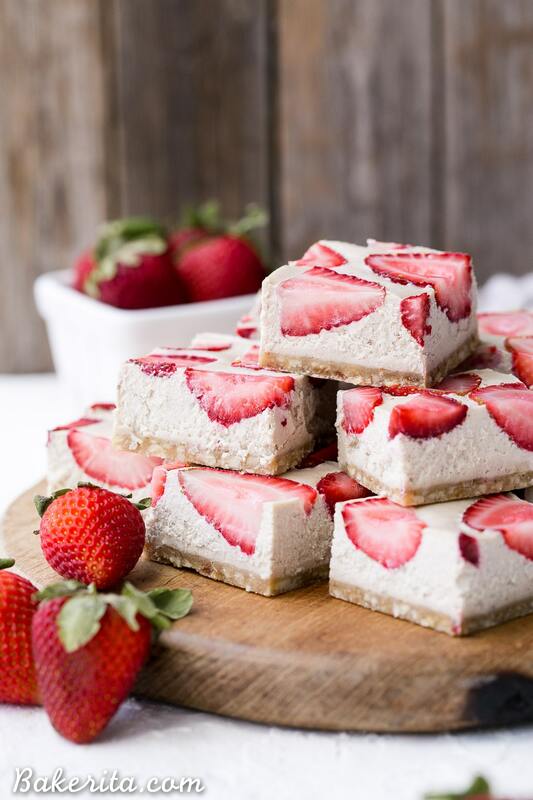 And strawberry shortcake, so perfect for summer! You’re too sweet, thank you so very much Beth! I can totally see how these would be like strawberry shortcakes! SO yumm! I patiently awaiting local strawberries… but I’m not sure if I’ll be able to wait. Your straw recipe and other is making me waaant some! Delicious work Rachel! I hate how long it takes to get local strawberries in Washington – we’ve had them for weeks here in San Diego. Very blessed :) can’t wait for you to get your hands on some! Thanks Traci. Thank you so very much, Lili! Hope you love them. These are so beautiful and summery! Take care. These are so pretty! I’m totally making these, thanks for sharing! Thanks so much Adriana, hope you love them! These look and sound amazing! You made me laugh a little when you said you leave the vitamix running while you clean things lol- multi-tasking at its finest. 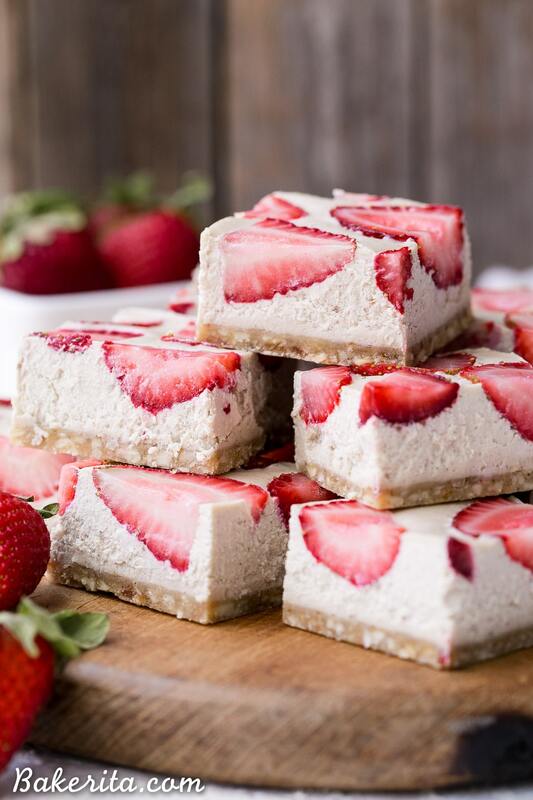 Anyways- I love how low maintance vegan desserts like this can be- and any summer berry in here would be bomb! Multitasking is a must, especially when it results in an ULTRA luscious and creamy filling! Thanks so much for the love Cara. Just curious if we can make these nut free? Using cassava flour instead? We have some major cashew allergies. Have you ever tried it or would recommend? Hi Courtney, unfortunately nothing else will substitute for the cashews that I’ve tried at least. They blend to be very creamy and flour won’t replicate that, since it’s not baked. Sorry I can’t be more help! Can I use ground almonds or coconut flour instead of almond flour?? I would go with ground almonds! Coconut flour is much more absorbent than almond flour so it’s best to only use it when specifically called for. I finally made this recipe! The cashew crust was amazing. I thought it tasted a little like a coconut cheesecake. Exciting that this is gluten free, vegan and with no refined sugar. I will definitely make again for Christmas. So glad to hear that you’re enjoying it, Tiffany! Thanks for your feedback. These are amazing!!!! My kids loved them. I just want to eat the entire pan. I would love to make this, looks amazing! What would you suggest for baking it in 9×13 glass dish? Hi Noemina, well you don’t bake this but if you’re putting it in that size dish, I would double the recipe. Enjoy!! sorry i thought to say to make it in 9×13..thank you! I bought some cashews but just notice that it doesn’t said they are row.. would that work it or not? thanks in advance! Hi Noemina, they might not be quite as creamy but it should still work! thank you! Do i need to soak them as well? So amazing!!!!! Turned out perfect!!! Kids loved, husband loved!! So excited to share these with everyone!! So thrilled they were a hit! Thanks for the feedback, Kayce. They’ll probably be good in the fridge for about 5-7 days, but 6 months in the freezer! !